Pomegranate can be recognized by its round shape, hard yellow, pink or red coloured skin and by its unusual interior flesh that contains many small edible seeds. A semi-sweet pulp surrounds each of these small seeds. 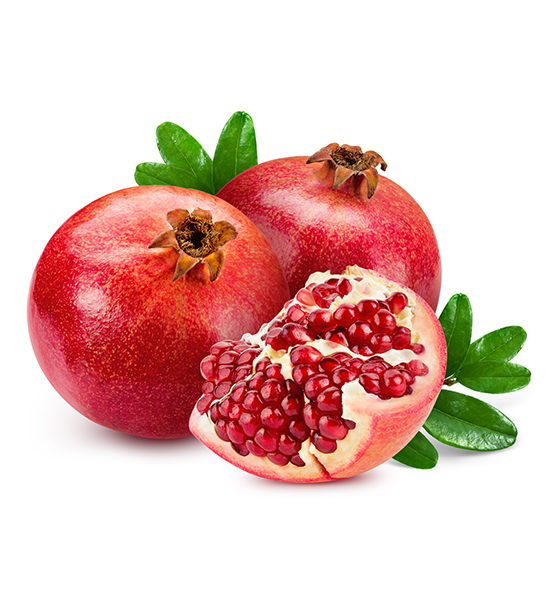 Pomegranates are listed as high-fiber in some charts of nutritional value. That fiber, however, is entirely contained in the edible seeds which also supply unsaturated oils. Although the membrane is also edible, it has no flavour and is typically not eaten. The pomegranate is a popular exotic fruit which origins from the Middle East and Asia. Also known as the Granada, Grenade and Chinese apple, pomegranates are now commonly grown in Africa, India, Malaysia, southern Europe and in the United States. Pomegranates thrive well when grown in regions where the temperature is mild and where there is little humidity. BeFresh provides the following varieties to its customers: Wonderful, Hershkovitz, Ako and Shany.